Driven by the success of its parametric solutions, AXA accelerates the development of these products by launching AXA Global Parametrics. 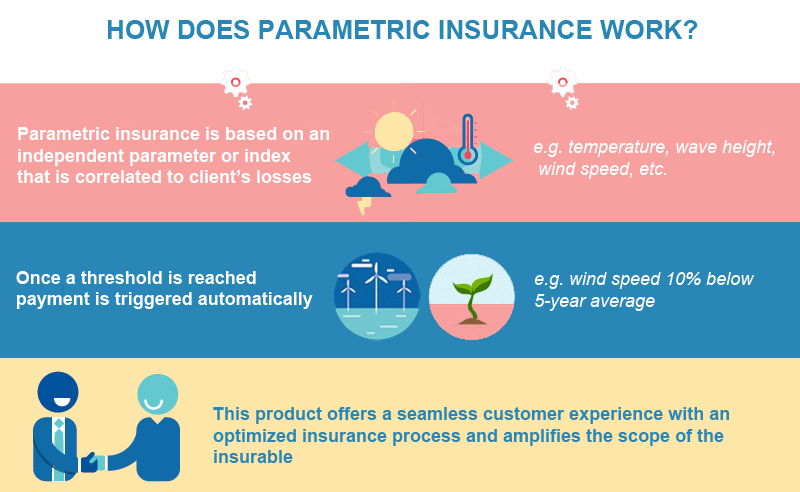 Parametric insurance is based on the use of a parameter correlated to a client’s damages or losses. A wide variety of risks can be covered through parametric insurance, such as adverse weather affecting businesses or causing crop losses. Since 2014, AXA’s parametric insurance team, then part of AXA Corporate Solutions, has developed a market-leading expertise in climate risks and worked with many different actors in various sectors across the world, i.e. weather-sensitive corporates in agriculture, renewable energy, construction, transportation, leisure and textiles, as well as with international institutions and governments. These products have convinced clients in 28 countries, and 40% of revenues have been generated in Asia. The newly created AXA Global Parametrics will broaden the range of solutions to better serve our existing customers, and expand its scope to SMEs and individuals. AXA Global Parametrics will support AXA’s P&C community and Group Innovation team in designing a broad range of parametric products to cover risks in many forms, both in mature and emerging markets. To lead this new entity, Tanguy Touffut, previously Global Head of Parametric Insurance at AXA Corporate Solutions, was appointed CEO of AXA Global Parametrics, effective March 1st, reporting to Gaëlle Olivier.